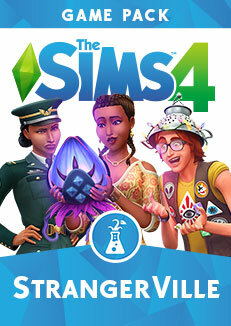 You buy .The Sims 4: Strangeville for Origin. Investigate and uncover the dark secret of a deserted town. Underworld Explore Strangeville, a mysterious desert town. In it, you will find unusual weather, eccentric inhabitants, dangerous plants, strange collectibles and much more. An exciting story. Send your sim to meet the mysterious and unexplored. Unmarked vans drive around the area, government agents use secret listening devices, and special scanners are used to detect suspicious activity. The Big Secret Conduct an investigation and go through military training to find clues and solve the mystery hiding within the walls of the secret laboratory. Outfits for any occasion. Set a special mood by dressing your Sims in desert clothing and military operations, or prepare them for the end of the world, dressing them in conspiracy clothing and secret agents or protective suits.